1) "MAYBE ONE DAY" HITS THE AIRWAVES! 4) SUPPORT: COMMUNITY FOUNDATION, RBC, MORE! 8) LAST CHANCE! REGISTER NOW! "MAYBE ONE DAY" HITS THE AIRWAVES! It took about six months of hard work with two self-advocacy groups, but it all came together on May 8 with a full-day of filming in and around Ottawa's Fifth Avenue Court building. The professional crew headlined by producer Jamie Banks of Affinity Productions and director Matt West worked with 8 novice actors from SMILE and experienced actor/writer Richard Kaulbars for 6 hours to compile all the material required for the final product, a 30-second public service message. 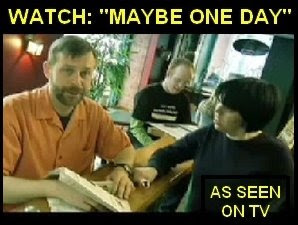 Maybe One Day is scheduled to have its first public broadcast on A-Channel Ottawa at 10:30 AM and again at 3:18 and 5:02 on June 19. Those looking for additional information will also enjoy the Maybe One Day web page (and check out the rest of our new website!) which features not only an online version of the public service message, but also information about the actors, footage from behind the scenes, and the history of the project's development. Please be sure to leave a rating and a comment on YouTube! 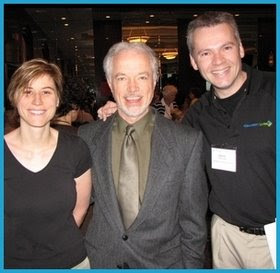 LiveWorkPlay staff traditionally spend one week per year engaged in a formal professional development process. This year the team headed off to Markham to participate in the Community Living Ontario 55th Annual Conference and Annual General Meeting. With about 500 delegates and special guests including the Honourable Madeleine Meilleur, the opportunity to interact with other staff, agency board members, and people with intellectual disabilities from across the province was an eye-opening experience! Welcoming Keenan Wellar and Julie Kingstone at the AGM was Community Living Ontario Executive Director Keith Powell (centre of picture). The conference offered insights ranging from the theoretical to the practical. LiveWorkPlay staff focused their attention on key issues of life transition. Of particular interest was the presentation by Noreene and Kirby Adam of Pembroke. The message will sound familiar to may LiveWorkPlay families, but Noreene and Adam have the experience to back it up, as reported in Community Living Leaders. 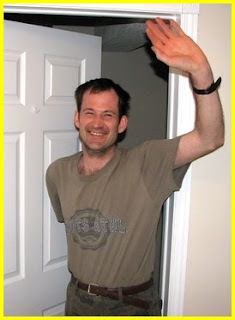 "You’ve got to try things, and not everything is going to succeed," says Adam, who serves as vice-president of Community Living Upper Ottawa Valley. "You don’t try just once. You might have to try a whole lot of times. We tried all different kinds of things before we got to the point where we all realized he wanted to live alone." Helping make the transition process easier starts when children are small, says Adam. "I always say that when they start school, start thinking about what they’re going to do when they’re done school," she says. "You have got to practice before the time comes." For more information about how what was learned at the conference relates to future directions for LiveWorkPlay, participants and families are encouraged to register now for Visioning Day on Saturday, June 21. A special revised agenda has been sent out to all LiveWorkPlay members by the Board of Directors. The fourth annual Roger Dodger Volleyball Tournament for LiveWorkPlay overcame the significant challenge of a scorching early season heat wave to raise just under $2000 despite the necessary cancellation of the planned euchre tournament. "It was a hot one out there," said organizer Ron Albert. "Thanks to sponsorship from Giant Tiger and Daquin for our food and event merchandise, the tournament was still a financial success even though we had to cancel some events. We'll cross $2000 next year for sure!" Enjoy photos from the 2008 tournament by clicking here: Album I Album II Album III. 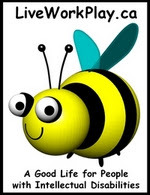 SUPPORT: COMMUNITY FOUNDATION, RBC, MORE! 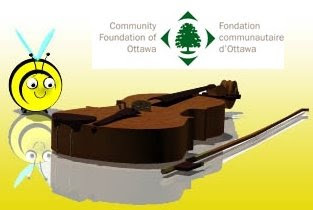 The Community Foundation of Ottawa is funding LiveWorkPlay efforts to provide access to arts and culture for people with intellectual disabilities through a grant of $13,000. There are many barriers that make it difficult for people with intellectual disabilities to enjoy the arts as either participants or observers. The funds will support a variety of expenditures ranging from musical instruments and equipment t o admission costs for events. In other funding news, support of $5000 for adult services has come in the form of a one-time grant from a new supporter, the RBC Financial Group (RBC Foundation). Industrial Alliance Insurance and Financial Services has contributed an additional $1000. SMILE participants have enjoyed experimenting with digital photography throughout the fall and winter, and LiveWorkPlay will be offering enhanced photography education and skill development in the fall. This will be made easier thanks to the donation of 10 digital cameras from Olympus! As a final funding note, an as yet unnamed contributor is announcing a new awards program that will be unveiled at the Engines of Success Recognition Banquet. Curious? Good...get your tickets now before they sell out! Chris Day from CTV Ottawa will be the event MC in the comfortable surroundings of the Hampton Inn Ottawa Conference Centre. Journeys participant Gillian Gillespie and her mother Felice Miranda have taken on lots of challenges in life. Gillian endured many years of taunting and teasing in the school environment, but has experienced success in recent years at a private school. She has also made new friends through her time at Journeys. With improvements in her school and social life, with the help of her mother she found the strength to fulfill her dream of publishing her own book, inspired by the J.K. Rowling Harry Potter series. 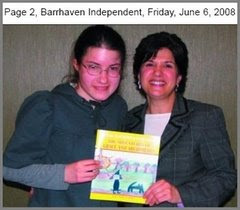 "I’m so proud that when you read the book, it’s Gillian talking, and the little witch named Grace...is a great example to people with disabilities...this is a huge accomplishment for Gillian," said Felice in the June 6 edition of the Barrhaven Independent (see photo, above). Gillian had a successful launch and book signing at the MBNA Recipe for Success on March 25 where she sold over 100 copies. 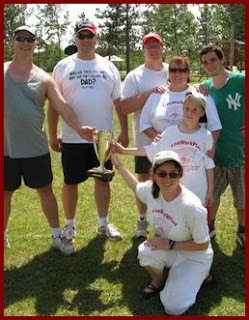 She has since attended a second book signing, which took place on June 7 at Royal Lepage Barrhaven Fun Day. You can get your own copy of Wacky Witch and Wizard World: The Adventures of Grace and Archimedes at Engines of Success on June 26, or purchase online! 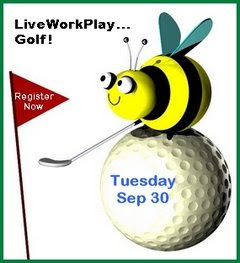 The Second Annual LiveWorkPlay Golf Tournament at GreyHawk has been moved from September 25 to Tuesday, September 30. This year's tournament will be played on the Talon course, which offers some tough risk-reward shotmaking oppo rtunities: ignore the water and bunkers or lay up? Sign up today and make your choice when the time comes! The volunteer organizers lead by Paul Sheldon and Pat McFadden are working hard to recruit golfers and sell out this event for the second straight year. Where they really need your help is with recruiting hole sponsors and door prizes. The tournament offers a great opportunity for exposure to a variety of community and business leaders. Contact Keenan at 613-235-9550 x 223 if you have contacts interested in learning more about supporting the event. Tim and Stephen moved in April 14 as the third pairing in the On Our Own Together Too transitional housing program. They impressed themselves and everyone around them with their demonstrated ability to manage a daily routine. This included fully independent travel to their workplaces and social destinations, as well as preparing and eating healthy meals with minimal assistance. Stephen also helped out by volunteering to mow the lawn of the property. When Stephen left a bit early to start a family vacation with his parents, it offered Tim the opportunity to live on his own. He moved out last week (see photo, right). Although he did miss his roommate, he also said "I enjoyed having the space to myself." In fact, he turned down the opportunity to go away with his own family to enjoy his last few days at OOOT-TOO. "It was a great experience for all of us," said Tim's mother Wendy. "There is a lot to ponder but we are moving ahead!" Visioning Day will be held at the Hampton Inn Ottawa at 9:00am sharp, with a special session for parents and the Board of Directors. For those who are interested, we'll leave from there for a BBQ feast at the pool party, which will once again be hosted by the Harris family. These are both free events - but Visioning Day is a pre-requisite for attending the pool party! First we work, then we party! The annual Engines of Success Recognition Banquet will also be held at the Hampton Inn Ottawa. This is an important night for recognizing our dedicated volunteers, celebrating the achievements of Journeys and SMILE participants, and thanking partners, funders, and sponsors. The celebrity MC for this year is Chris Day from CTV Ottawa. The banquet doesn't work without a big enthusiastic audience, so register today for a delicious meal and great entertainment. Along with lively recognition ceremonies we'll also have image and video presentations, and probably manage to dig up a blooper or two! We hope you have enjoyed this 20th edition of LiveWorkPlayNews. If you have received an email about this blog in error and/or you would prefer not to receive future LiveWorkPlayNews messages, simply click here and follow the simple instructions. That same web page can also be used by newcomers who would like to join LiveWorkPlayNews, so feel free to share the address with friends, colleagues, and family who might like to subscribe.